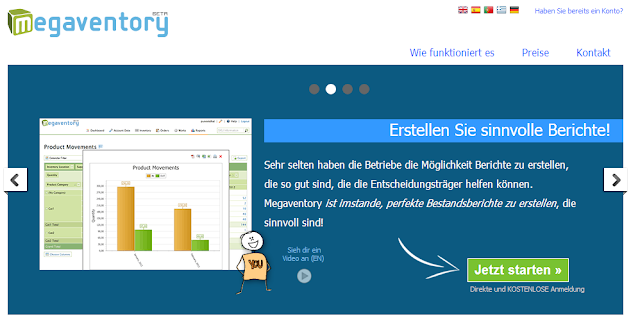 We're once again excited to announce that yet another language has been added to the list of languages Megaventory supports - German is live and debugged! You can find the German language version either from the top flag icon or here. Currently we formally support 6 languages (English, Spanish, Portuguese, French, German and Greek) while there are many unofficial translations (i.e. not fully tested) ranging from Japanese to Arabic. Soon we will be releasing more localizations so that a larger part of our audience can manage their business in their native language. This is also an excellent opportunity to mention that any admin user can localise their Megaventory account both to the language they prefer but also to the specific industry terminology - or indeed the preferred terms used in the particular business. But more of that in a following post.